Entries for the Hoard will be accepted until the last day of January, 2018. Yes, shuttles, ground vehicles, fighters, drones, etc. But what motorpool doesn't have mechanics, engineers and machines that go 'ping'? As always, even if it doesn't fit the theme, we can usually find a way to fit your project in. This hoard got my fingers twitching! But first, we need to set the tune. After lining up all those vehicle projects that I wanted to do for a long time... there are too many for a single month! The bane of any modeler is having no one interested in the end result of his work. So, to optimize my workload, I'll make a little query, pitting the three projects most likely to see the end of the month. Chris made it at beginner stages of his paper modeling career. I want to see how would it look if he made it a decade later, utilizing all he had learned along the way. The project consists of modernizing the model, possibly to the point that no one would recognize it anymore. I want to make something that Chris would wish to assemble and put on top of his desk. This beasty and Onager are from his later works. 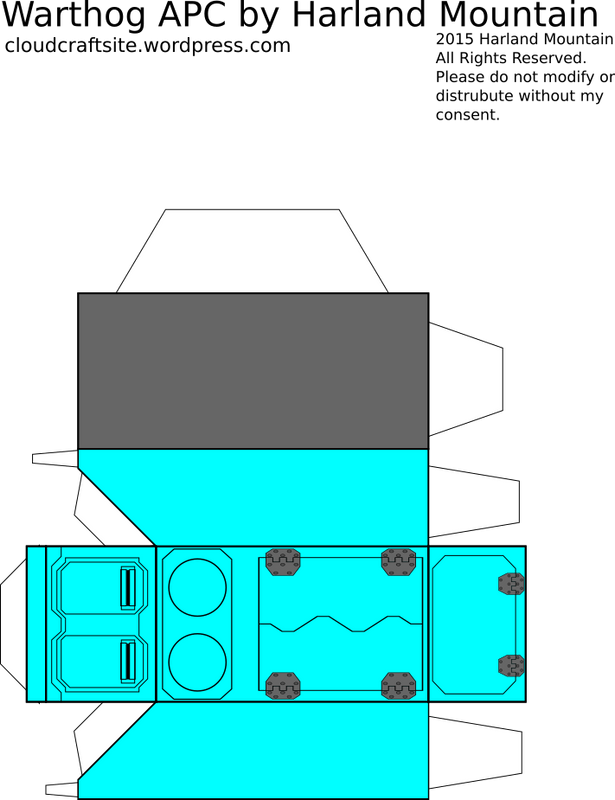 I want to make a few differing vehicles, each based on the same schematics, but with differing properties. A "model series" any army/mercenary/prepper would be proud of. No more shall your struggling colony have to endure the suffering of competitor products! The old workhorse will get a few alternate versions, turning it into a series of vehicles suitable for Colony workloads of any kind. So there it is. Think about it and cast your vote. I'll have a few feasibility tests for two to three days, and then will start the most voted project. I like the Onager Idea, if for no other reason than to volley into the new year. Dang it. I just spent the better part of tonight working out the geometry for a not HISS tank and it looks like the LV86 Onager. I could just save my self a crap ton of time and Just Kitbash the onager. OK, so I have two ideas for this month's Hoard, neither of which are "Future Motorpool" (because, you know, any theme is acceoted and I am crap at texturing vehicles.) They are both organics, one of which will be another Bug derivative (although not properly a bug at all) and the other of which I am still trying to determine the feasibilty. But a question: my weird bug deriviative will be highly based off the strider beastie from World of Warcraft, which is usually a green or blue. I am going to do it in pink for myself, because it's gotta match everything else in my collection. Do all y'all want it in just the green or blue, or is there actual demand for the pink stuff too? I think that pink should be represented! How else can you get a titter out of the players who think all bugs are boring? Not future. Maybe motorpool. Only a repaint from the Mitsubishi site, but it wouldn't seem out of place driving onto Whiteman AFB. 'tis a bottom plate of a papermodel. A teaser of sorts. Headaches are releasing their grip, I'll start to tinker tomorrow. Last time I was on Whiteman AFB was about 15 years ago? Only pickups I saw Dodge or Ford. Why does this make me think of Archer's El Camino? I don't think he had an El Camino back when I was watching. So, I don't know. Sorry about the horrible picture. A question for all y'all: I can make them a bit bigger and have two per page, or a bit smaller and go three per page neatly. Do they need a couple of tentavles do you think? I think bigger is always better for BUGGZZZ! And whatever tentavles are, why not? Maybe the Martian host have been taken over ? . . . They look beautiful and nice work! Tentacles are done. "2 per page" Pink Striders are done, including tentacles (20% larger than the ones pictured.) I will hopefully get them printed and assembled Moonday or Twosday, as well as tentacles for the three I have already built. How about a kitbash of a kitbash? I am working on squirmydad's Longhauler to have the treads from the Onager. So far so good, I just need to elevate the trailer wheels now to compensate for the added height of the tractor. And of course test build it, but it seems good so far. Christopher Roe sure inspired a good portion of this hoard. I was trying to get a jump on the Hoard files. We do have a template for submissions, though it evidently isn't popular to use. 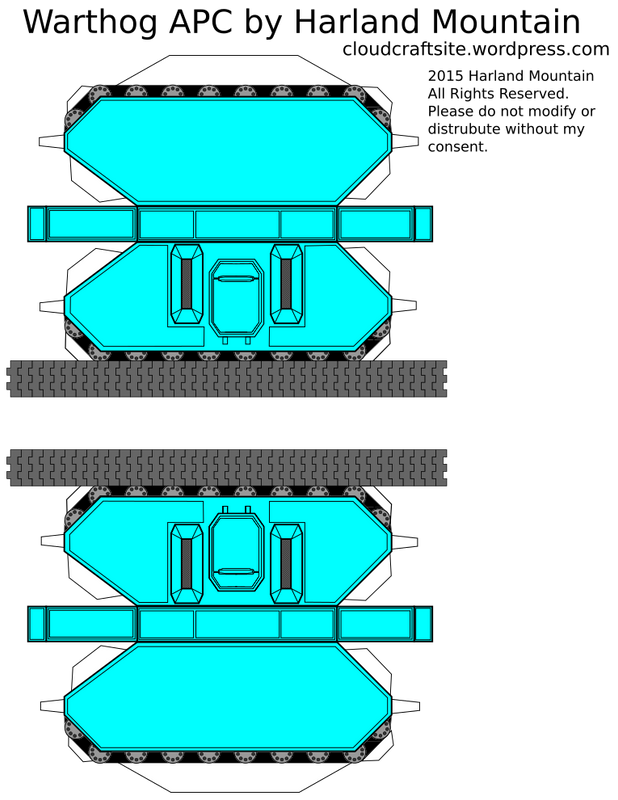 I hope that I have the APC enlarged enough from the original file. Had to resize the text and squeeze things together on the 4X4 GPV's. At this point, I have a draft of the Striders (pre-tentacles), but I'm going to hold off on those until we have a final template. I also need to get the Police Tactical formatted. Other than the Onager Longhauler, does anyone else have something working?